Book 1, The Devil Takes Half, was a finalist in the mystery category of the Eric Hoffer Awards and received a starred review from Library Journal. “This novel’s attraction lies in Serafim’s portrayal of life in modern Greece and the complex relationships between Yiannis and those around him. Serafim deftly weaves Greece’s debt crisis into the plot, and provides readers with fully-developed, complex characters. She lightens a grim plotline with the interactions between Yiannis and Papa Michalis.” Read more…. If you enjoy mystery and murder this is a rare find. The descriptions of Greece are wonderful and help to take you there as you journey into the horror and history of the Nazi regime. This would be a great book for a reading club with a great deal of background to decipher. Read more…. “A deftly crafted and thoroughly absorbing read from beginning to end, When the Devil’s Idle is a compelling and very highly recommended addition to community library Mystery/Suspense collections…. Also very highly recommended is the first volume in this outstanding series, The Devil Takes Half. Appreciative readers will all be looking eagerly toward author Leta Serafim’s next title in her Greek Island Mystery series.” Read more…. “Let me be honest. I don’t usually like novels I can’t identify with. So I expected to be bored by this story. I thought it would be a lot of background of Greek history, mythology and religion. Greece never interested me. I never would want to go there. So I was taken by surprise by the author, Leta Serafim’s seduction of my senses. She so deftly interwove the background into the story that I craved to learn more…. I won’t spoil the plot for you. Tracking down the history of the victim and Maria will hook you….. You will enjoy every well-crafted word in When the Devil’s Idle.” Read more…. 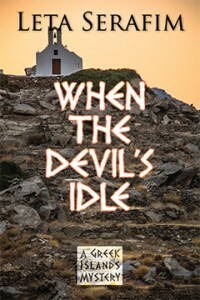 “When The Devil’s Idle is set in Greece with interesting characters and a wonderful glimpse at Greece’s culture. The main character Patronas was quite likable and a bit comical despite the seriousness of the situation he and his fellow policemen were investigating. He was a great character to keep the book interesting and moving along.” Read more…. “I enjoyed following the journey of the investigation and how it led Yannis to the horrible truth. I always relish a good mystery and this one certainly delivered on all counts.” Read more…. “When The Devil’s Idle is loaded with twists and turns and red herrings that will leave you guessing all the while you are flipping pages to find out what happens next. Ms. Serafim has provided us with a marvelous whodunit and I am already looking forward to the next book in the series.” Read more…. In the Book of Revelation, written by St. John on the Greek island of Patmos, it was said a pale horse would appear whose rider was death, others would cry out for vengeance, and the stars of heaven would fall to the earth. Death does indeed come to Patmos when a German tourist is found murdered in the garden of one of the island’s fabled estates. Yiannis Patronas, Chief Officer of the Chios police, is called in to investigate. He summons his top detective, Giorgos Tembelos, and his friend and amateur sleuth, Papa Michalis, to assist him. What the policemen discover will disturb them long after the conclusion of the case. Only six people were at the house at the time of the murder—the gardener and housekeeper, the victim’s son and his wife and their two children, a boy of seven and a teenage girl of sixteen. All appear to be innocent. But access to the isolated estate is severely restricted. Surrounded by high walls, it has only one entrance: a metal gate that was bolted at the time of the crime. Patronas can only conclude that one of the six is a killer. He continues to probe, uncovering the family’s many secrets. Some are very old, others more recent. All are horrifying. But which of these secrets led to murder? Leta Serafim is also the author of the historical novel, To Look on Death No More, which will be published by Coffeetown Press in February, 2016. She has visited over twenty-five islands in Greece and continues to divide her time between Boston and Greece. Click here to find her online. The police cruiser arrived later that day and Giorgos Tembelos and Papa Michalis disembarked, the priest inching down the ramp like a tortoise. “Why would he change his name?” Patronas wondered. The four of them were sitting outside by the water, it being too hot to venture inside. A haze hung over the sea, and the air was very still. Suddenly, a soft breeze rose up and stirred the tamarisk trees that lined the shore, setting their feathery branches in motion. Patronas liked the rustling sound the trees made, the relief the wind brought. It was almost as if he could hear the earth breathe. I’ll go swimming tonight, he told himself, looking out at the harbor. Float on my back and look up at the stars. Frolic like a dolphin. Maybe he’d ask Antigone Balis to join him. He pictured her dripping wet, that long hair of hers hanging down over one shoulder like Botticelli’s Venus. Adrift in his vision, he subsequently lost track of the conversation. “Hey, boss, you with us?” Tembelos nudged him with his elbow. And around they went again, weighing the possibilities. The victim had been hit on the head, but with what? A hammer or a rock? A shovel or pickax? Rock, scissors, paper. Forget swimming, Patronas told himself. I might as well drown myself.